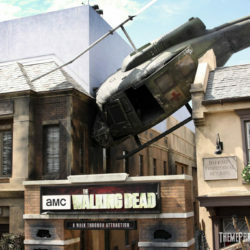 Universal Studios Hollywood has opened its newest attraction, a walk-through experience based on AMC’s The Walking Dead. 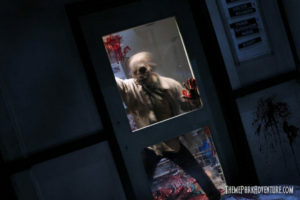 The Halloween Horror Nights-style haunted house soft-opened to the public just a couple days before its announced 4th of July grand opening. 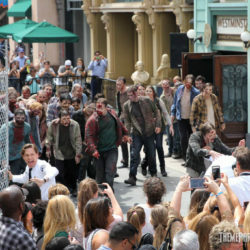 Days before that, Theme Park Adventure was on hand for the media preview, which featured a whole herd of walkers bent on getting their 15 minutes of brains… er, fame. 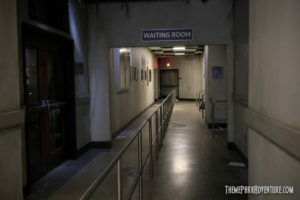 If you’re familiar with Universal’s wildly-popular Halloween Horror Nights event, then you already get an idea of what’s in store once you make your way through the exterior switchback queue and enter the abandoned remains of Harrison Memorial Hospital – the location where The Walking Dead series begins. True to HHN-style attractions, this new year-round haunt takes approximately 6 minutes or so to get through. 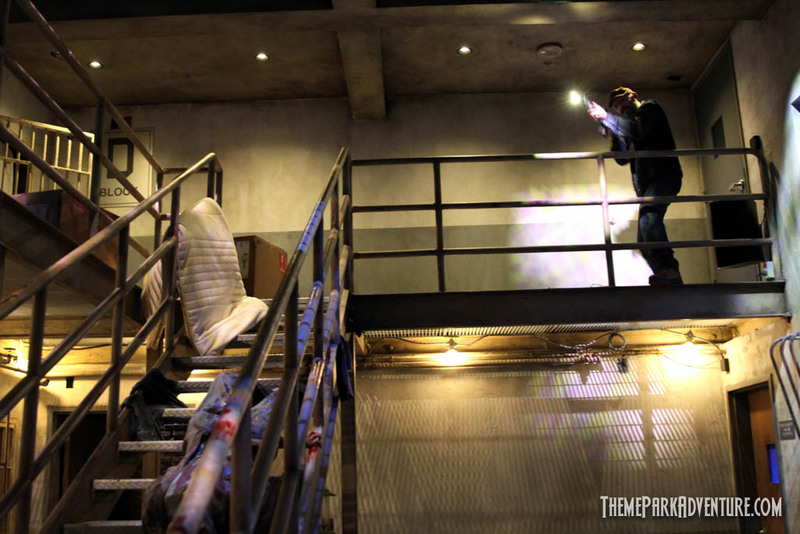 Park fans will find it a lot shorter than House of Horrors, which existed as Universal’s daily-operating haunted attraction from 2006 to 2014. 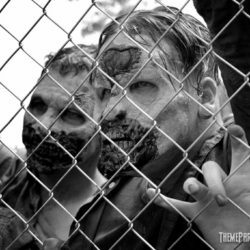 That said, The Walking Dead packs a lot into each scene, putting it on par with the former experience and right up there with most Horror Nights mazes to date. Guests are leaving the attraction laughing, clapping, and yes – even crying; that’s exactly what designers John Murdy, Chris Williams and everyone else involved in this project wanted to see. 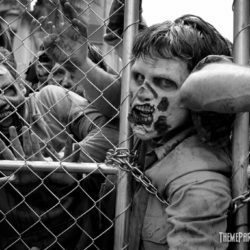 The Walking Dead attraction employs a team of men and women actors, who are transformed into terrifying “walkers” that inhabit each section. Mixed in cohesively with robotic figures and animated props, the live actors are hard to spot – until it’s too late! 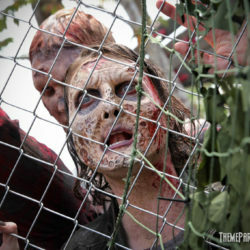 Relying on the same tech that’s used in most Halloween Horror Nights mazes, many of the talent spots in The Walking Dead feature both lighting and sound cues that are triggered at will to enhance their scare tactics. 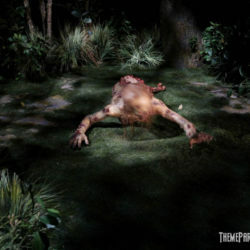 Each time we went through the maze, the actors were on point, and the scare factor was extremely high as they sprung out of hiding at guests walking through. 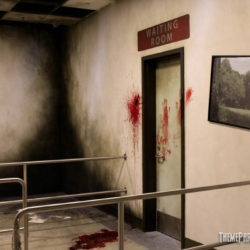 Fans of the Walking Dead mazes that have been featured for the past several years at Halloween Horror Nights have already visited most of the locales depicted in this permanent walk-through attraction, so there are few surprises as to which scenes/moments from the series are featured. What is nice, is how polished everything looks. 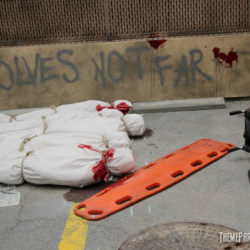 We have always been really impressed by the quality of Universal’s Halloween mazes; the details are usually incredible. This is certainly the case here, and then some. 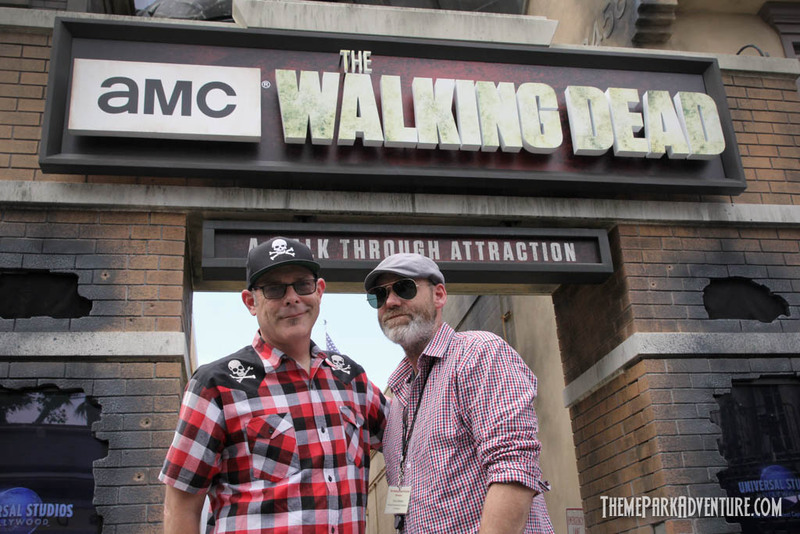 Knowing that the attraction will be around for years to come, Universal has designed each scene beautifully, using really great lighting and sound, as well as completely realistic scenic fabrication to transport guests into the world of The Walking Dead. 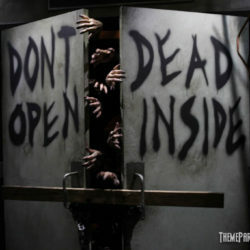 One of the most iconic visuals – the “dead inside” doors – have been placed right into the queue, featuring a lot of walker hands reaching from beyond. 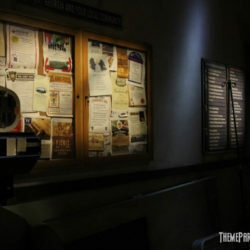 This vignette was inspired by a shot in the series, and intensified for the attraction. Placement in the queue was very deliberate, as to give fans an opportunity to take selfies, group pictures, etc. without disrupting the flow of the maze itself. This was a smart move on John Murdy’s part, and the fans are already taking full advantage of this incredible “picture spot”. 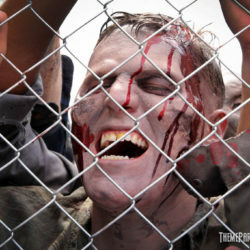 Groups are pulsed slowly into the maze, which can make even a lightly-populated queue wait seem a bit long. On opening night, the crew averaged about a minute to 90 seconds between groups being sent in. The upside to this, is a nicely-paced experience without the dreaded conga line effect, where the entire maze is backed up, snaking (or standing still) slowly through each scene. So far, the pulsing seems to be working, so we hope that Universal Studios’ ops team recognizes that this is a good thing, allowing for a really smooth, exciting experience for everyone. Here’s a tip: Toward the end of the night, crowds are almost non-existent at Universal Studios Hollywood. 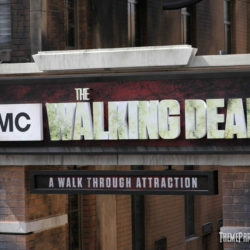 We were there for the attraction’s opening day, and arriving at The Walking Dead about 40 minutes prior to park closing, we were able to go through four times with little to no wait whatsoever. 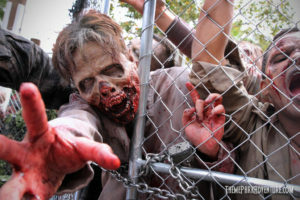 We highly recommend doing The Walking Dead immediately when the park opens, or if you get there later, to wait until the last half hour or so of operation before getting in line. 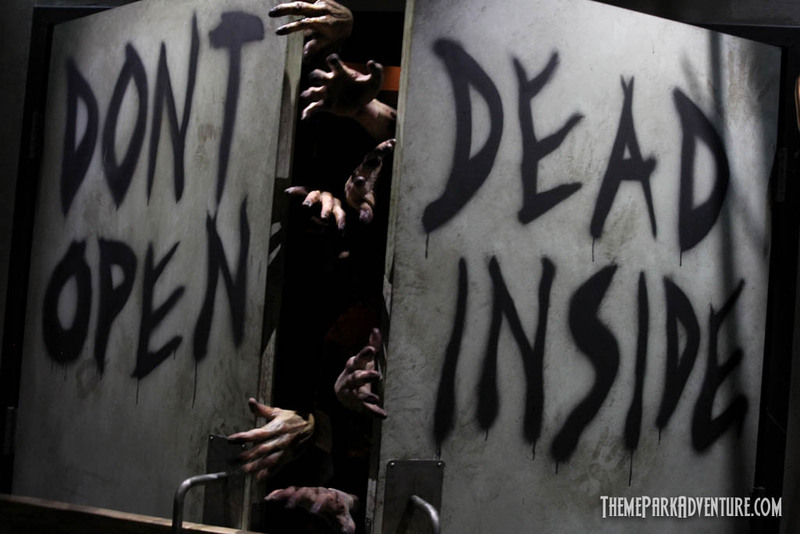 There’s no need to wait 90 minutes when you can hit this attraction last and literally walk right in. The fact that there’s no one in line at night is in no way a poor reflection of the attraction itself; even Harry Potter and the Forbidden Journey is a walk-on most nights at Universal Hollywood. 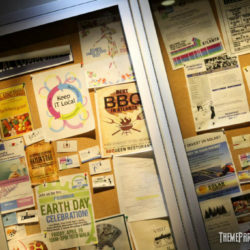 Crowd levels currently have nothing to do with the quality of attractions or experiences to be had at the park; we feel it’s because USH is still not a “full day” investment, and that Universal has priced its tickets and annual passes way beyond what most locals and many guests are willing to pay. 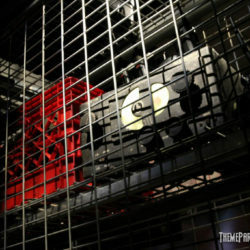 That’s an ops issue, not creative; we’re sure Universal will figure it out sooner than later – so in the meantime, take advantage of very low crowd levels at night! While we’re not going to get into heavy spoilers here – again, that’s not what we do – we do want to mention that there is a burning cabin scene in the middle of the experience that was done really well. 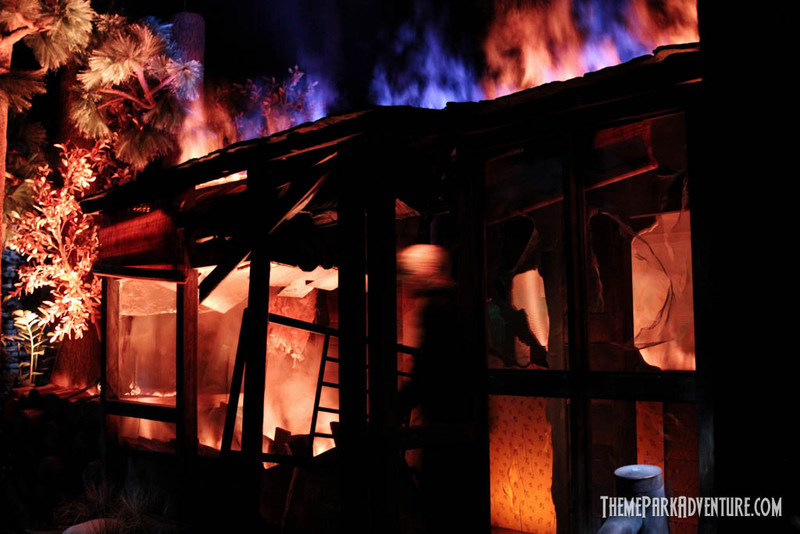 Everything from the staging of the structure to its special faux fire effects, the scent of burning wood and the use of heat to enhance the moment – it’s all been executed brilliantly, and is definitely a show-stopper in our opinion; perhaps the biggest “wow” moment scenic-wise in the entire attraction. We’d be remiss not giving huge props to the live talent in the maze; these folks were rocking it just as hard at the end of the night as they were during the day. Most folks don’t realize how incredibly demanding it is to be a haunt monster for a little while, let alone hours at a time. The great news, is that they all get to work indoors, where the air conditioning is new and nice! Everyone we saw looked like they’ve found their groove and were loving working the new attraction. 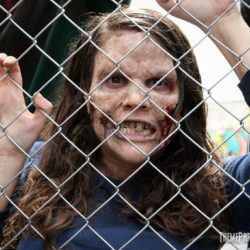 Congratulations to the entire team at The Walking Dead; it all looks great! 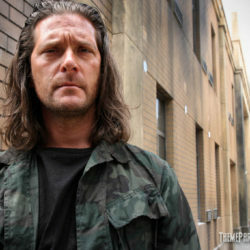 Murdy, Williams and their team really pulled off quite a bit in a short amount of time. There are some aspects of the maze that I suspect were changed at the last minute, and we likely will see some tweaks made in the weeks ahead. 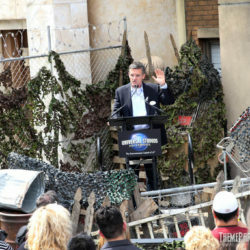 During Halloween Horror Nights, there will be many more actors in the maze, and the intensity level will be turned up, for sure. 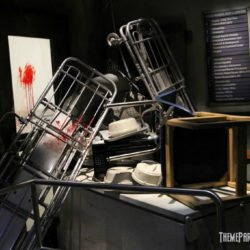 Until then, we have a really fun, very cool year-round haunt again at Universal Studios Hollywood, and we’re completely stoked about that. 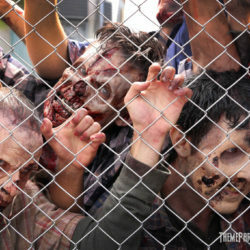 Get on out to Universal and check this new attraction out! 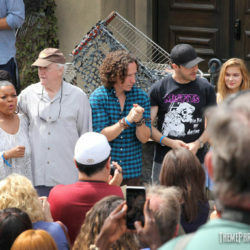 What a summer here in Los Angeles – wizards and walkers galore! Yes, please! And thank you, Universal! 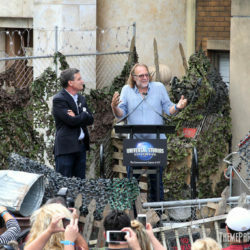 Greg Nicotero at the media opening. 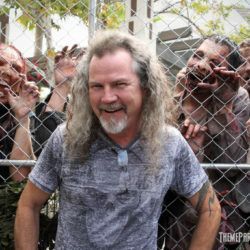 Larry Bones, master of HHN makeup effects! 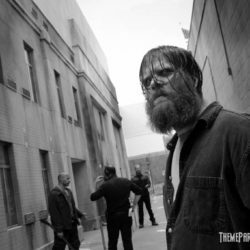 This entry was posted in Haunted Attractions, Home Page, Home Page Slider and tagged Chris Williams, Haunted Attraction, John Murdy, Rick West, The Walking Dead, Universal Studios Hollywood. Bookmark the permalink.